Do you still remember a moment of pure joy, wonder, and innocence? Tell you what, Bingers. I just recently did! And there’s no other better way to start my 2019 than with Walt Disney Pictures’ Mary Poppins Returns. Most of us grew up watching Julie Andrews at the 1964 movie, Mary Poppins. It has been more than a decade since I last saw the movie so reliving the magic and music of the sequel brought back some of my happiest memories. With that, let me share with you, Bingers, my review of Mary Poppins Returns. Last January 4, 2019, Walt Disney Philippines welcomed 2019 with the special screening of the much-awaited Mary Poppins Returns in SM Aura Premiere. Celebrities and members of the press attended the event. It was even my first event and movie screening of the year! Alright, let’s get down to business? Yes! The movie introduced us to the magical voice of Lin-Manuel Miranda singing while cycling at the streets of London. The skies are dark and there is a sense of grim in the air. You just know that this is no longer the cheery atmosphere that the first movie played in. Well, in hindsight, it no longer is because the Banks children are now adults. Their fantasies are no longer valid as they now have to face the reality of adulthood. Michael Banks (Ben Whishaw) is residing at their family house at 17 Cherry Tree Lane along with his three adorable children. Visiting them constantly is his sister Jane (Emily Mortimer). The household is a handful with three lively, innocent, and yet wildly enthusiastic kids. Luckily, Ellen, the long-time family housekeeper is there to help with the chores. Things are no longer as easy in the house as there is a looming possibility for it to be repossessed by the Fidelity Fiduciary Bank. This is where the whole thematic problem of the movie comes from. It was a tough time for London and the Banks are not spared from it. 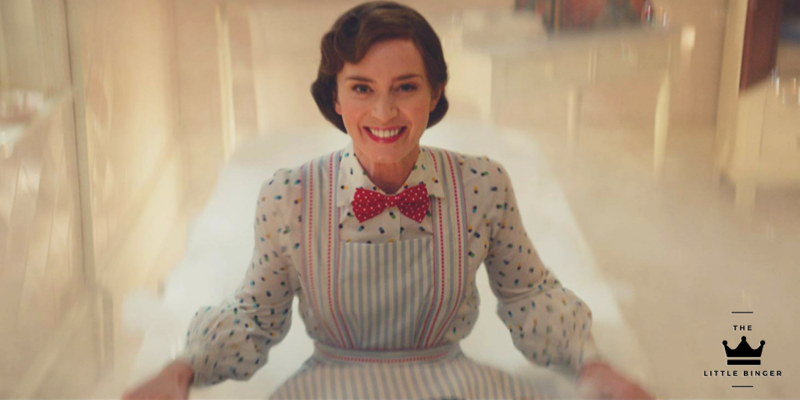 On the brink of affecting the children’s childhood, Mary Poppins returns to introduce some joy and add color to their lives. The moment Emily Blunt appeared on screen, I couldn’t help but be amazed at the flavor that she will be sprinkling at the iconic character. Comparing her to Julie Andrews is just unfair, I thought. And as the movie progressed, it turned out that I was right. It was as if she took everything about the character, deconstructed it, and delivered a version for the movie that was nothing short of terrific. She is prim, commanding, and downright adorable, with Blunt’s Mary Poppins, the legacy lives on. There are two things that made me enjoy Mary Poppins Returns: the colors and music. Rob Marshall does what he does best in the movie and that is delivering spectacle. From the integration of reality and traditional animation to Topsy’s turned over fix-it shop, the movie delighted the eyes, the heart, and the ears. It was a complete experience that was sure to keep the kids’ attention and the satisfy the adult’s need for some distracting enjoyment. Behind the spectacle is a rather tired plot. Depression, adulthood, and the tale of loss innocence- it was not exactly original as it reminded me so much of Christopher Robin. The only difference is the bad guy played by Colin Firth. Firth’s character was stereotypical in every way that I almost despised it- an evil financial guy. Sure, the film wants to play on the effect of adulthood in losing one’s innocence but I wish they had gone deeper or on a more personal level. But hey, this is a Mary Poppins movie. It is supposed to be light and fun. The choreography and original music should be the primary reasons for seeing the movie. Now that you have read some of my criticisms about the movie, should you still see it? Of course! Yes! The performances alone should be enough to pull you in. Also, it is a nice reminder for us, adults, that not everything has to be serious. We gotta some time to be reminded of our childhood. Look for that sense of wonder. Indulge in your lost innocence. Have Mary Poppins Returns spark joy in your life. PREVIOUS POST Previous post: Penn Badgley and Shay Mitchell are Coming to Manila for YOU!